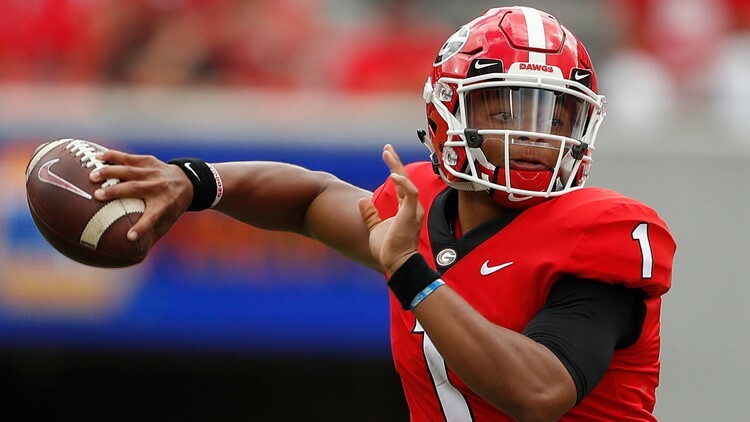 After transferring from Georgia, quarterback Justin Fields will be eligible to play at Ohio State in 2019. After losing Dwayne Haskins to the NFL Draft, Ohio State appears to have found its new starting quarterback. On Friday, Ohio State announced that quarterback Justin Fields has been approved for eligibility in 2019 after transferring from Georgia last month. Had he not been granted such waiver, Fields would have been required to sit out the 2019 season under NCAA transfer rules. Although Fields is expected to compete with Matthew Baldwin for the right to succeed Haskins this spring, it would be surprising if the ex-Bulldogs signal-caller wasn't the Buckeyes' starting quarterback on opening day. A former 5-star prospect, Fields arrived in Athens last fall as the No. 1 dual-threat quarterback and No. 2 overall prospect in the 2018 class, trailing only Clemson quarterback Trevor Lawrence, who would go on to lead the Tigers to a national championship in his freshman season. But with Jake Fromm still on campus, Fields' path to early playing time wasn't as clear. Appearing in situational and mop-up duty in 12 games, the 6-foot-3, 225-pound Fields completed 27 of his 39 pass attempts for 328 yards and 4 touchdowns, adding 266 yards and 4 scores on 42 attempts on the ground. Speaking to reporters in Columbus on Wednesday, Fields said that it was Day's NFL pedigree that ultimately lured him to Ohio State. In just one season as a starter, Haskins developed into arguably the top quarterback prospect in the 2019 draft. “It was great to see what he did last year," Fields said of Haskins. "I’m just hoping to do the same thing." With Friday's news, the highly touted quarterback won't have to wait for his opportunity to do just that.